Here is a link to OSHA’s current Fall Protection/Prevention Campaign. This site has some good tools and resources to assist you in promoting fall hazard awareness in construction. 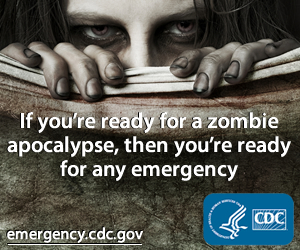 This is a joint effort from numerous safety organizations and regulatory agencies around the country. Fall Protection; always one of the most common violated standards and yet one of the most likely to cause serious harm. I took these photos as I was in line to get some food at a drive through establishment. I would consider this a high profile job in a busy shopping complex area. Makes you wonder sometimes what the project superintendent is doing. 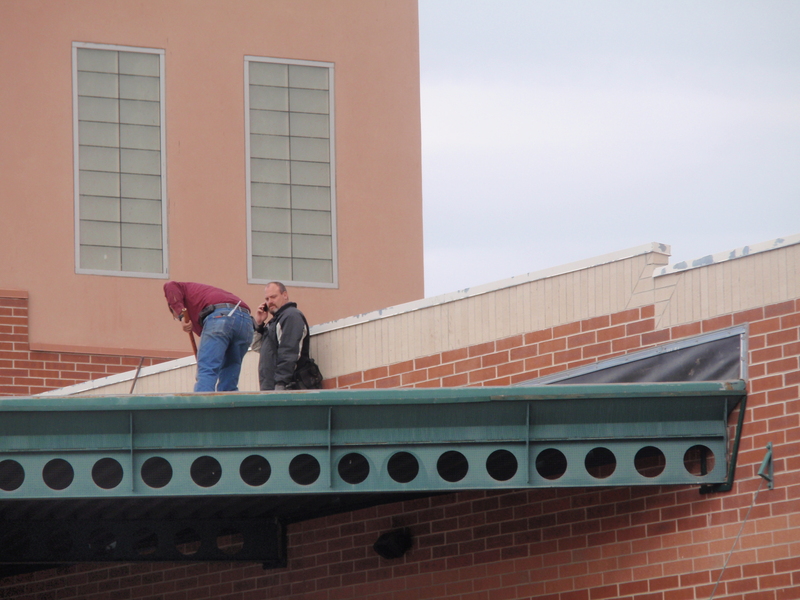 OK, so in one of these photos the employee is tied off, but the supervisor is not and is walking all over the roof. One of the other photos has an employee that is tied off but the rope grab is set at the end of the rope not doing him much good if he falls. The other photo depicts an employee who was tied off but was getting ready for lunch so he disconnected at the peak of the roof to go have his food. This illustrates a common problem in construction today; employees and supervisors know they need to have the equipment and wear it while on the job, but fail to do it properly because of laziness, lack of caring, or any other such excuse. I love the ignorance of people sometimes (it’s why I have a job). Here is a retailer looking to promote some heavy duty construction clothing to potential customers. They want to illustrate that this clothing will hold up to extreme wear by construction personnel. I get this mentality, makes good marketing sense. Let’s show a person wearing our clothing while working on a frame building. However, they are also illustrating the fact that their climbing harness (for rock climbing) is adequate for use while performing this kind of work and sending the wrong message to those same customers. I get that they were probably trying to find a way to secure the mannequin to the structure, but they inadvertently (or perhaps it was a conscious thought) that climbing equipment is approved as fall protection in the construction trade. I guess my point is that I wish people would think before they act and consult some good professional advice if they have questions. This just irks me because of the mixed message and the improper use of equipment NOT designed for this type of use. OK, so here’s the story about this one. The contractor is building a patio at a restaurant. 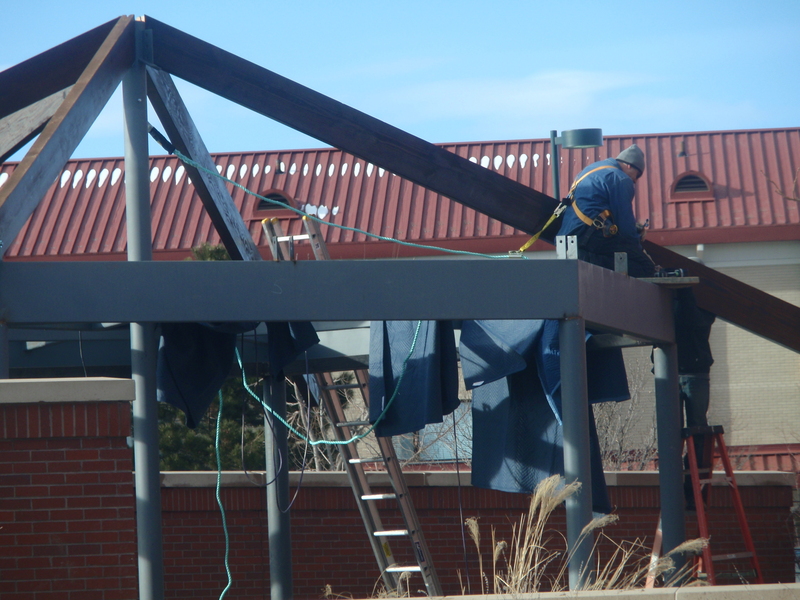 The worker IS secured to the structure with a rope grab, harness, and an anchor strap. My concern is that the worker is only about 10′ off the ground, his rope and grab are about 6′ from his anchor point to his back D-ring and he has a 3′ lanyard attached to that. If he falls from the height of 10′ is his fall protection equipment really going to help him? I will let you do the math on that one. Sometimes we have the best intentions and even know what is required of us. However, without adequate training and competent people on staff are we really doing our part for employee safety? I know I use a lot of fall protection photos, but there are often so many violations with this issue. This is one I took today at a local shopping center. I like how the worker is up against the leading edge while the manager was talking on his cell phone just behind him. Obviously no regard for health and safety nor do they know or care about fall protection issues. Many of you might know them as DBI/SALA, or Protecta, or the old UCL, but now Capital Safety (parent company) is being acquired by KKR. Check out the details on their website. Not sure how this is going to affect the company overall, but I thought it was worth noting. Also of note, there is a recall on Protecta shock absorbing lanyards. Check out the details on the website. PROTECTA SHOCK ABSORBING LANYARDS Recall Notice Capital Safety is aware of a reported inadvertent disconnection during use of the locking snaphook used in a series of Y-shaped Protecta lanyards with twin elastic lanyard legs that both attach directly to the eye of the snaphook. The locking snaphook used on these lanyards is part number 9502573. This is not one of those “WOW that’s really bad” moments, but it does warrant some discussion. The following are just a few questions to get the safety/compliance juices flowing. 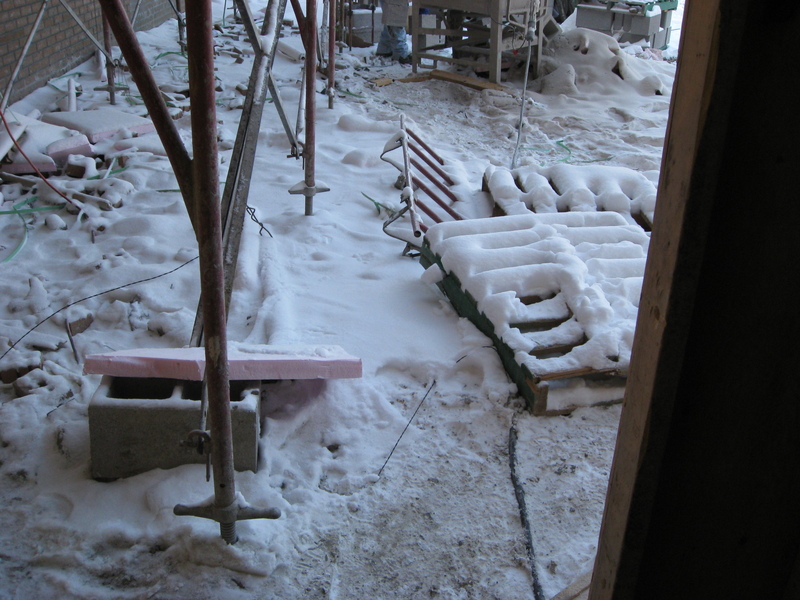 How does a competent person perform a quality inspection of the scaffolding when the feet and other parts of the structure are covered in snow? Is my housekeeping really that good if I see lumps in the snow? How do I know what hazards may/may not exist if they are buried under the fluffy white stuff? How am I heating the building and do I now need to worry about noxious gases building up? Air monitoring? Are we now operating gas-powered equipment inside since it is too cold to go outside? What does my access/egress look like? Do I have clear means of entry and exit that are free of ice and snow? What condition are my extension cords in now that they are covered in snow/ice and buried under all that stuff? Are my employees still staying hydrated? Even though it is snowy and cold does not mean that they will not get dehydrated. 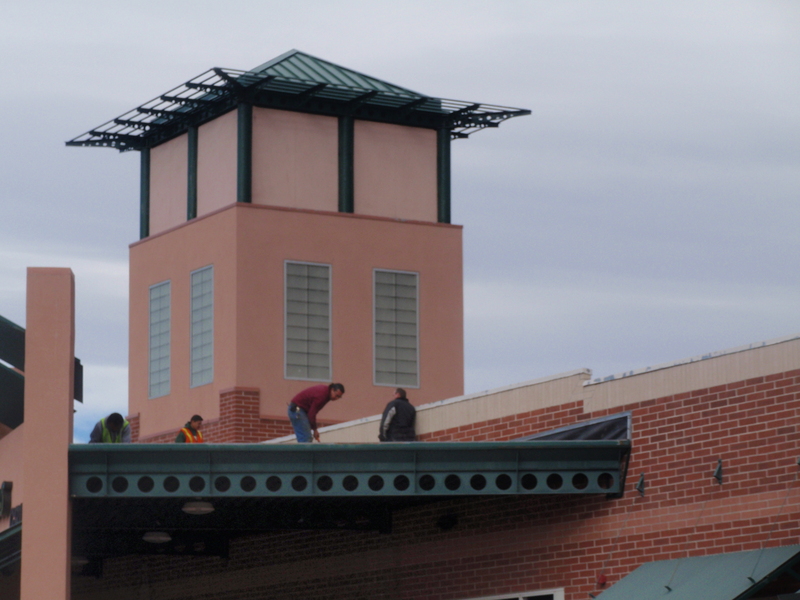 Are we going to allow employees to work off of the scaffold if all of the planking is icy and covered with snow? You get the point. I’m sure you can come up with a bunch more questions to ask yourself with regards to these types of conditions. Feel free to post your comments if you have some you would like to share.